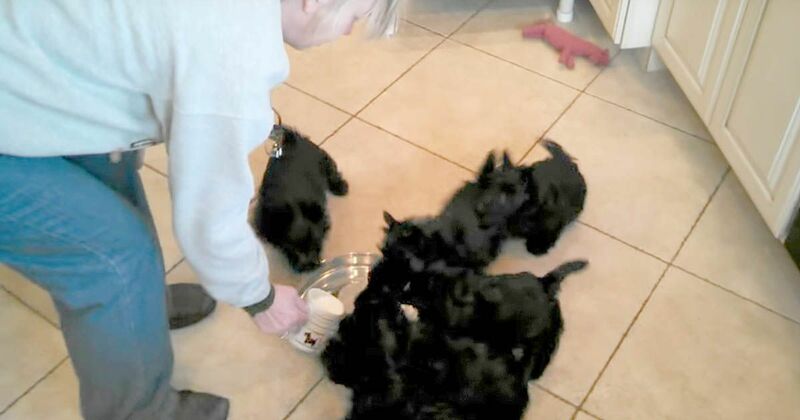 Meal time for these Scottie puppies is always an exciting time due to their unusual dinner ritual. As soon as their owner pours goat milk into their saucer, six Scottish terriers quickly arrive and spin around their dish. Their owner calls it the "Scottie pinwheel," and based on how she responds this is something that happens quite frequently! The American Kennel Club describes Scotties as "spirited," and that's exactly how this clip makes them look! It almost seems like they're so excited to eat that they had to do a little dance! Did you think this video was as adorable as we did? Let us know by sharing it with your friends!